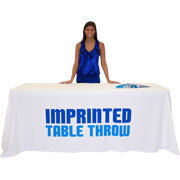 Get your company logo and graphics printed onto one of these table covers, throws and runners. 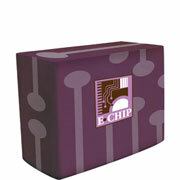 Ideal for trade shows events and retail. 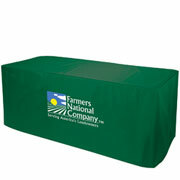 Every table cover includes a flame retardant certificate; is machine washable and wrinkle resistant. If you have any questions about choosing the right table cover for your event please call us toll free at 1-855-536-3385 or contact us by email. 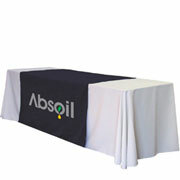 A full range of table throws to fit with several logo printing options, including 3-sided, convertible and fitted throws. 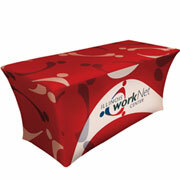 Made from heavy-duty poly-stretch fabric that fits snugly over a tables. Include a handy zipper in the back for under-table storage. The 42″ Round Table Cover is tailored to perfectly fit our portable, folding Bar-Height Round Table. 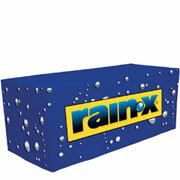 Weather and stain resistant, suitable for indoor and outdoor events. Great for company picnics, banquets, festivals and more. 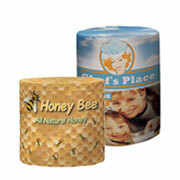 Bring that extra touch to your tabletop presentation, and can provide an appealing contrast to your table throw.